Amanda Hyphenated | I have a really long last name. I had this painting commissioned in 2004. It’s by Lynette May (http://www.heykillah.bigcartel.com). i will be using this blog to post some stuff… but mostly i’ll be over at http://dnbrd.org. huzzah! I plan on blogging about Shiver by Maggie Stiefvater really soon… spoiler: the book will win. You can enter to win the next book in the series, Linger, by clicking on the link above! DO IT. I was not the only Book Pirate out there, and it was making me mad. So now I am books vs. dinosaurs!, and I have a gimmick. For each book, instead of a starred rating, I will decide the outcome of a fight between the book in question and a dinosaur. If the book wins, it was awesome. If the dinosaur wins, the book was not that great. The size and type of the dinosaur will vary, according to the book. Capiche? I know, weird. Ann Burg’s novel-in-verse, All the Broken Pieces, is about Matt Pin, an adopted Vietnamese twelve-year-old with fresh memories of the Vietnam War. Matt is technically half Vietnamese and half American (his father was a G.I. ), but no one in his small town sees the American side of him. He was adopted as a ten-year-old; one can only imagine the things he saw during the war. All the Broken Pieces is set in 1977, and most of the G.I.s had already come home. Matt does not have an easy life, even though he has a wonderful, caring family that loves him. He constantly thinks about the mother and brother he left behind. He tortures himself with thoughts that his new mother and father are going to send him away. Eventually, Matt finds solace in an unlikely place: talking to a group of Vietnam vets about their experiences in his home country. I really, really did not want to read this book, but it’s on the list for a Mock Newbery Club I am part of, so I kind of had to read it. Reason 1 for my hesitancy: the cover features a picture of a baseball. “Oh no,” I internally groaned. “Not a book about sports.” Reason 2: it’s a novel-in-verse. I am not a fan of poetry or verse… it usually seems too sparse for me. Ok. Reason 1 was sort of an issue, because a good majority of the book takes place at Matt’s baseball games and practices. I’m not big on sports metaphors. Reason 2 was only minorly an issue, and it was mostly in my head. I tend to think that when people write in verse, they do it to seem fancier than they really are. In my opinion (OPINION), it could potentially be a sign of pretention. I was trying to evaluate this book by Newbery standards, and I was having a hard time because of the verse. Just because something is in verse does not mean it is well-written. To me, it’s sort of a smoke screen (“Don’t look at my lack of writing skill! It’s a poem that doesn’t rhyme! Alakazam!”). I was also aware of the verse structure, which took away from my enjoyment of the book. Some librarians and other book folk say that novels-in-verse are good for reluctant readers because they are typically easy and fast to read. I’m not sure about that. I was reluctant to read this book, and I love reading! I will say this, though: there are not enough books about the Vietnam War. Or Cambodia. I think we are far enough past the 1970s to be able to write candidly and creatively about this difficult period. All in all, I appreciated Burg’s effort (it’s her first novel) and willingness to tackle a difficult subject. It’s hard to fit so much emotion into not very many words. The book won this one, but not by much. It might have gotten nibbled on by a compsognathus for a while. I am currently doing my practicum at the Middleton Public Library. (A practicum is like a library school internship.) Every week I make a new teen book display. 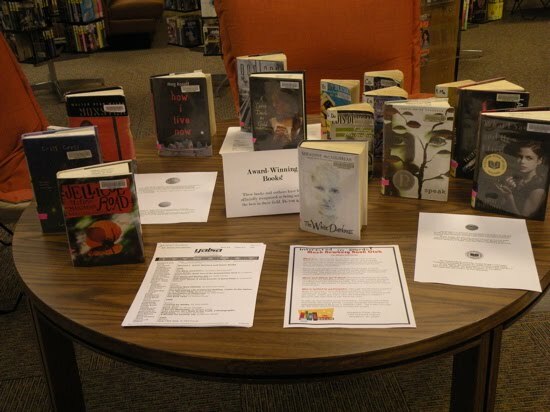 This past week, my display had the theme “award-winning books.” I included books that had won the Newbery, the Printz, the Morris, the National Book Award, and the Margaret A. Edwards Award. I love making book displays! My next one is going to be of “nerd” books. Then: Halloween! Displays are fun because it’s like creating a bibliography that people can see and touch. I was dreading reading this book. I really was. I’m participating in a Mock Newbery Club at my local public library, and this book was on the list for the first meeting. The title didn’t seem appealing, and although I like Naylor’s other books, I wasn’t sure about this one. Then I picked it up at the library. Whoever designed the cover should be scolded. It looks like, as my boyfriend said, “a Christian novel about finding the path to Jesus.” The cover features two girls carrying a picnic basket or cooler between them. They are walking down a flowered path in the forest, surrounded by muted tones and a feminine font with the book’s title. It looks like a book from the late 1980s or early 1990s. But it was published this year! Note to book packagers: this sort of packaging turns readers off. A better cover for Faith, Hope, and Ivy June would have been a simple monochromatic background with the outline of a mountain peak. Now to the actual novel: Ivy June Mosley and Catherine Combs are both 7th-graders in Kentucky middle schools. They both live with their families. Ivy June lives in Thunder Creek, a tiny rural community with no phone lines, no running water, and a strong dependency on coal mining. Catherine lives in Lexington, “the city,” and she goes to a fancy private school. The two girls apply to an exchange program where they go live with each other for two weeks. That’s the premise. Ivy June goes to stay with Catherine first. It’s really difficult for Ivy June to assimilate into rich society because she isn’t used to the amenities that city life provides. Ivy June is a smart girl, however, and she holds her own. The book develops into a rich, wonderful novel when Catherine goes to stay with Ivy June. She comes from a polite, genteel family, but she sort of breaks down when she realizes that she can’t wash her hair (they don’t have a shower), or check her e-mail (computers? what’s a computer?). A few terrible coincidences bring Ivy June and Catherine together, and show the reader that a family is more than just blood relation. I absolutely loved this novel. What could have been overly saccharine or didactic was sweet and thoughtful. Naylor writes about the hill country in Kentucky with grace and skill. In fact, the hollow where Ivy June lives is a character of its own. This novel could have gone the way of stereotypes about hillbillies, rich people, and the Appalachians, but it doesn’t; each character is nuanced. Even Catherine’s step-grandmother, who acts despicably to Ivy June, isn’t painted as completely villainous. Shirley, Ivy June’s best friend, is one of the most believable characters in the novel. Shirley starts ignoring Ivy June after Catherine comes to stay in Thunder Creek, and her standoffish behavior made me think back to middle school. Ivy June is definitely the main character here. Catherine chimes in every few chapters in the form of a journal entry; it’s interesting to see events from her point of view. However, Ivy June’s family and home life is the most important setting in the novel. Her mother, Ma, is critical of her dreams and aspirations; her sister, Jessie, is nineteen and works at the sweatshirt factory; her father is an out-of-work miner. Ivy June lives with her grandparents because there isn’t any more room in her parents house. Her Mammaw and Pappaw (grandmother and grandfather) are two of the most endearing characters I have ever encountered. They are “folksy,” but not in a stereotyped, stock character kind of way. They are wholesome and comfortable. Ivy June has to help take care of her Grandmommy (great-grandmother), and in these scenes, she is a mature, responsible adult waiting to spring out of adolescence. I’m not sure if this will win the Newbery, but I highly recommend this novel for 6th-10th graders, especially girls. Also, this book will make you really hungry for fried chicken and biscuits, so stock up! Link to Faith, Hope, and Ivy June on Amazon: hardcover. Link to Phyllis Reynolds Naylor on Wikipedia: she’s prolific!